About two years ago, I took a trip to Munich, Germany with my then bf (now fiance). We stayed in the bohemian borough of Schwabing rather than the city center to save money on our hotel. Every morning, we would walk the 30-40 minutes to get to the downtown area. Along the way, we always stopped into a bakery to get chive and butter pretzels. These pretzels made our long walk feel shorter. 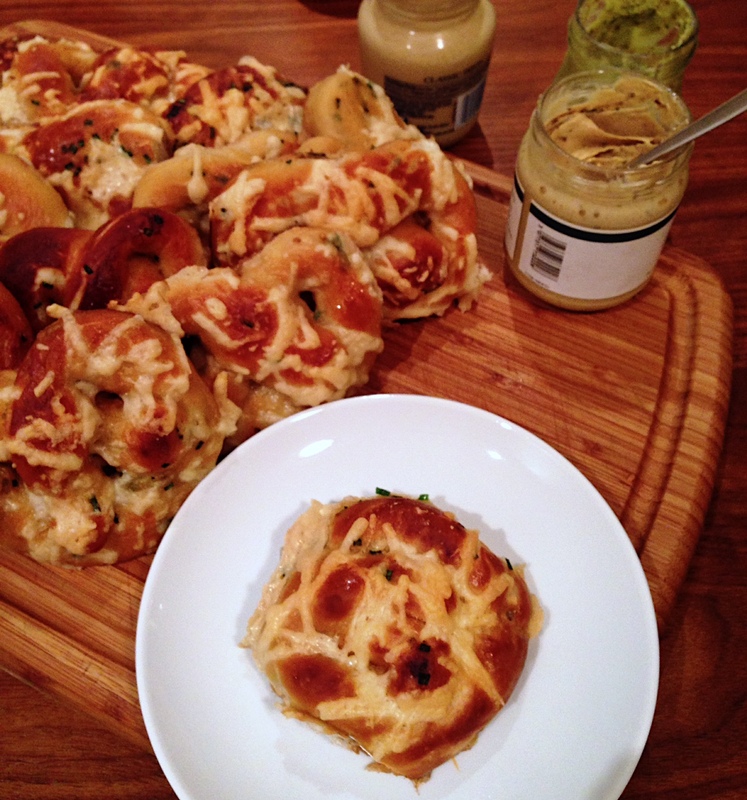 Recently, I came across Alton Brown’s Homemade Soft Pretzel Recipe and made them for my fiance’s birthday party–the theme was quintessential German (or at least what Americans think of German): beer, sausage and of course, pretzels. After that successful attempt, I thought I would re-create them in honor of Oktoberfest, but with chive, asiago and mustard seeds. 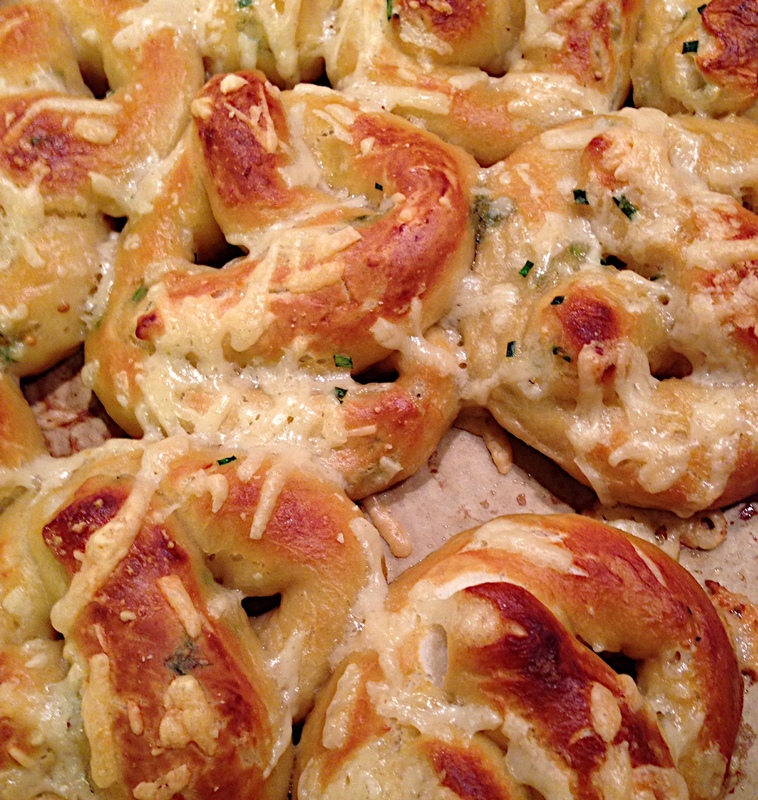 For this recipe, I followed Alton Brown’s Homemade Soft Pretzel Recipe through the first paragraph until you get to the point where you are ready to form your pretzels. At that point, I cut the dough in my proofing bowl into 16 sections (you can do 8, too) and took the dough and stretched it out on my floured work surface so it resembled a long rectangle. If you have trouble stretching the dough, lay it flat and poke lightly with all ten fingers until it is flat. 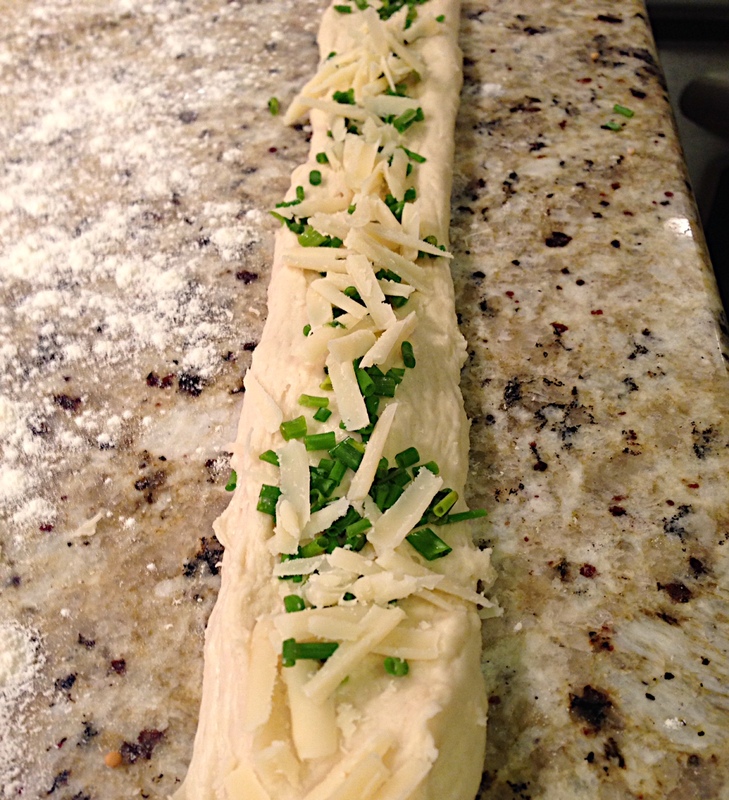 Then, fill with a bit of chives, asiago cheese and a sprinkle of mustard seeds. Lift and pinch the edges of the dough together until its tube-like. Take opposite ends and form into a U-shape, pull down and cross it at the center and secure the ends to the bottom of the U with a dab of egg-wash or water. Repeat with the other 15 or 7 pieces. Then, continue to follow the rest of Brown’s instructions: boil the pretzels one by one for 30secs in water and baking soda soda, line them up on a tray, brush with egg wash, sprinkle on some asiago cheese and salt (optional, I found the asiago salty enough) and bake for 12-15 minutes at 450 degrees F. Remove from the oven and transfer to a baking rack; do not skip this step or else you’ll have soggy bottoms, and no one wants a soggy bottom! Fresh out of the oven, before the cooling rack.